Arrival at Weymouth, following set-down stops at Wareham and Dorchester, was punctual. Unfortunately, platform 2 was occupied, so the tour had to use number 3, which is not ideal for photographs. However, the platform is rather longer than the official 12 coach lengths, so opportunities were possible. Running a twelve coach train did prevent photographic stops. 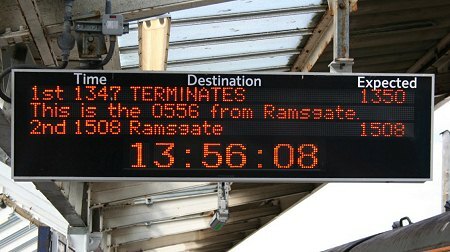 Many station platforms are too short and it is difficult to schedule stops of more than a minute or so at the few places where the platform would be significantly longer than the train. Weymouth's fish and chip shops benefited from the tour. Queues were out into the street at those near to the station. The outward working had been a bit roundabout, but the return was particularly special. It was the longest, direct journey possible by third rail electric train anywhere in the world. The distance of 227� miles could have been cut slightly by running via East Putney, but that is not of great significance. 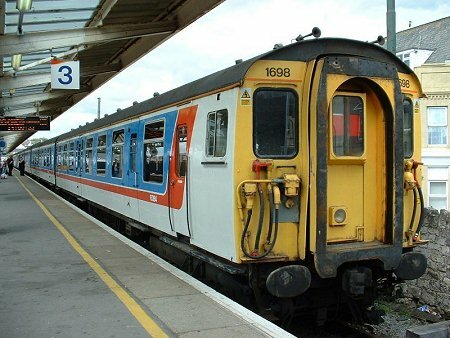 Operation of a twelve coach train to Weymouth needs special permission and electrical control room staff have to monitor its progress carefully. 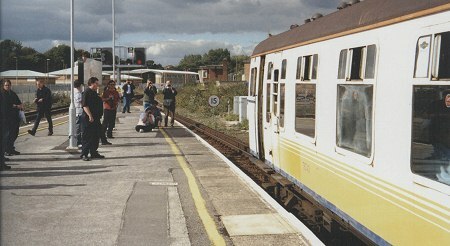 Observation of the ammeter in an intermediate driver's cab indicated that the train was driven in series up the bank out of Weymouth, the same technique that was adopted on the Folkestone Harbour branch. Well the tour promised passengers "from east to west as far as the third rail will take us" and here is the 12 car formation at the western extremity of the conductor rail network having completed the longest direct journey possible by third rail anywhere in the world. 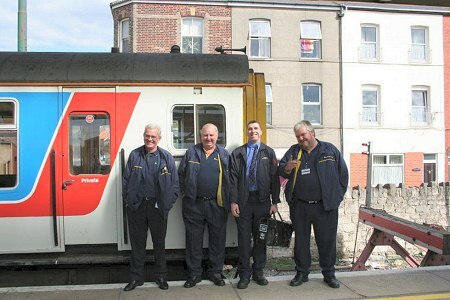 The train crew for this leg of the tour pose at Weymouth. Good job those raffle tickets were put on board at Barnham! 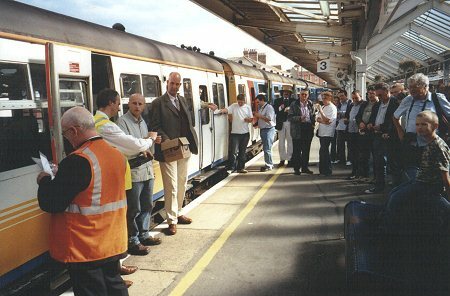 The raffle, proceds to charity, is drawn on platform 3. Platform 3 at Weymouth is not ideal for taking photographs but at least the train is not up against the platform ramp. Soon after arrival, this is a quiet moment judging by the number of photographers. Indeed most had made a dash into Weymouth to get a late lunch.